Thanks so much for your kind comments on this post. I’m having another sad day today because I got another negative and found out that 3 people I know are pregnant. I am happy for them, but not for me. 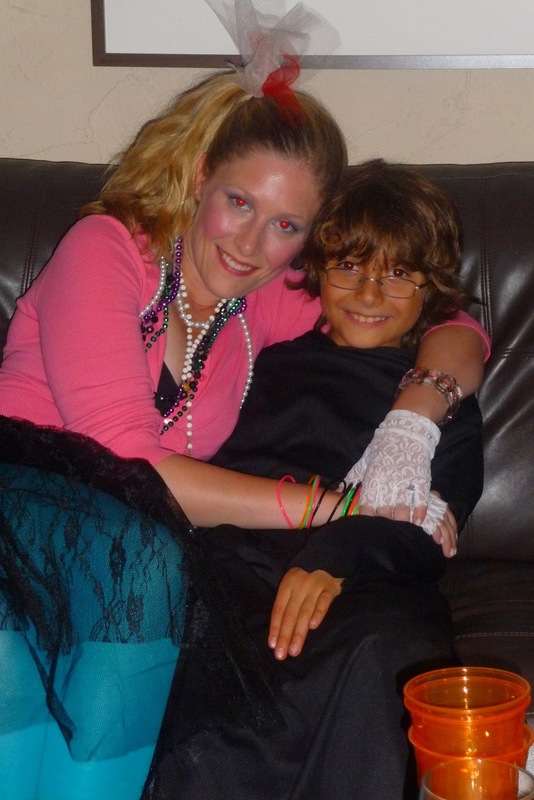 SOOOO I though I’d recap our Halloween weekend to lighten the mood around here. For Friday at work, I dreseed up at Montressor from Edgar Allen Poe’s “The Cask of Amontillado.” If you don’t remember the story from high school, it is the one where the guy (Montressor) wants revenge on his friend (Fortunado – dressed as a clown for Carnival) and he lures him down to his family’s catacombs where they stored wine as well as dead bodies. Then, he kills his friend by chaining him to a wall and building a tomb of stone around him. I wore a normal dress with tights and boots. I added a little black mask and red cape to take me from regular day to Halloween. 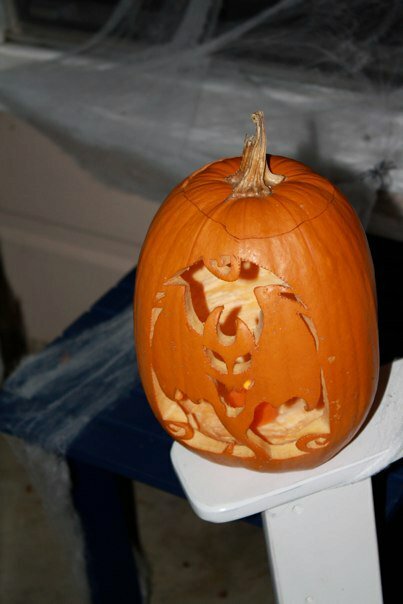 I didn’t take any pictures, but I do have one of the pumpkins my Speech class carved! 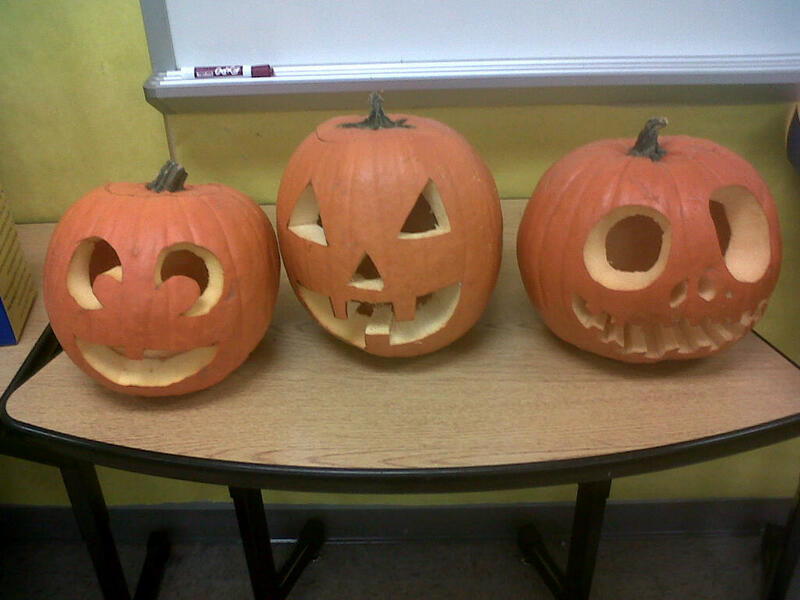 One student did his demonstrative speech on how to carve a pumpkin. He brought three different pumpkins in the different stages of carving. One girl in the class had never carved a pumpkin before so when the speeches were over, she carved the one that had been cleaned out, but didn’t have a face yet. 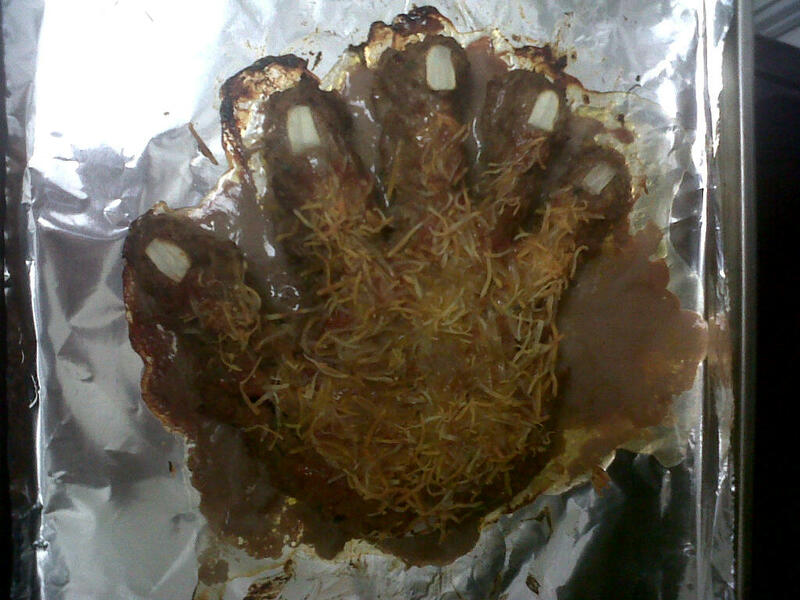 That night for dinner, I made a meat hand, inspired by Not Martha and my blog friend Ali of His Birdie’s Nest. I should have cooked it on a rack so the fat could have drained off, but I think it was pretty good for my first attempt! See that wrist bone? Made on onion. 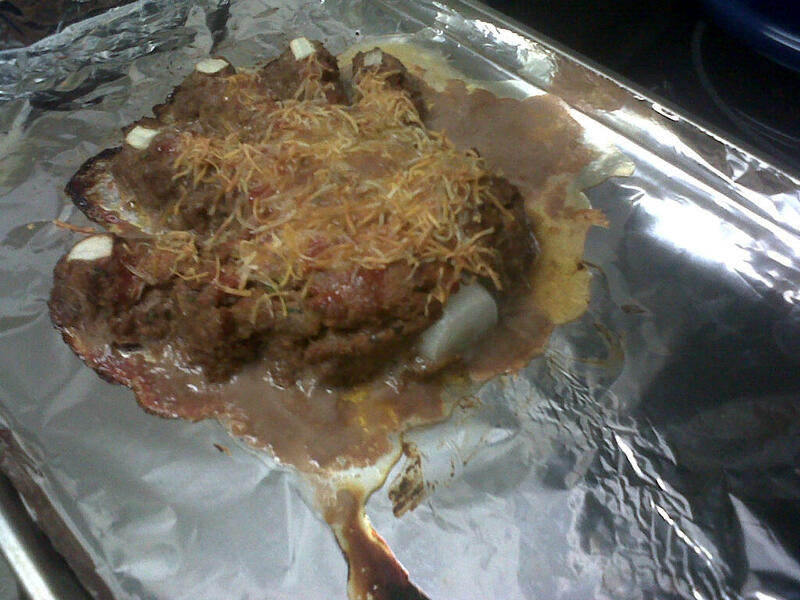 The meatloaf tasted pretty good, too! 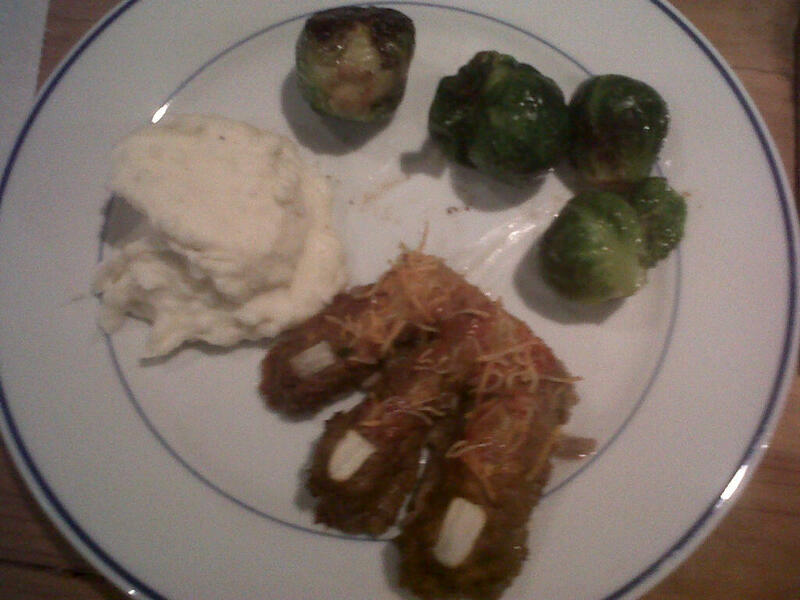 Meat fingers, brussel sprout eyeballs, and monster mash (thanks Andy)! After our dorky themed dinner, we carved our pumpkins! We did three: a bat, a werewolf, and an owl, but I only have a picture of one. On Saturday night, we went to our friend’s 30th birthday party. 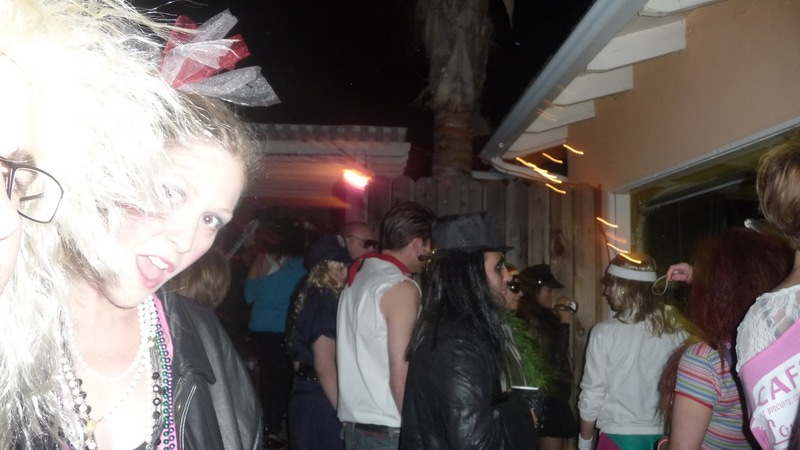 It was 80s themed and they had an awesome band who played great 80s songs all night. Check out Prince’s guitar! And David Bowie had the best makeup. 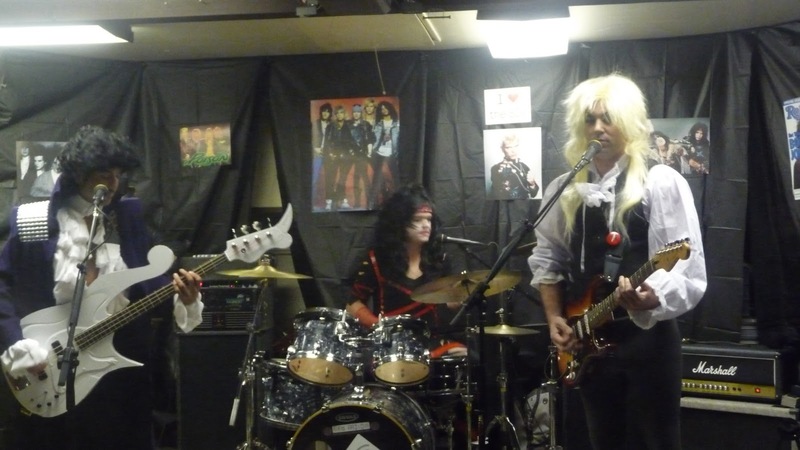 My husband had an awesome blonde mullet wig and meant to be an 80s rocker, but since he was wearing his glasses, everyone thought he was Garth from Wayne’s World. 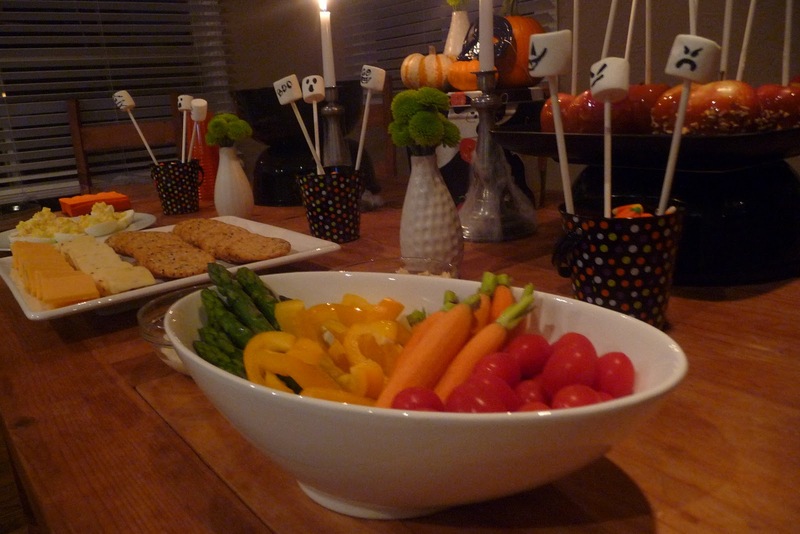 Sunday night, we decided to have a few friends over for snacks while we passed out candy to trick-or-treaters. I love that our neighborhood is busy on Halloween night because I never had that growing up (lived in apartments most of my life). 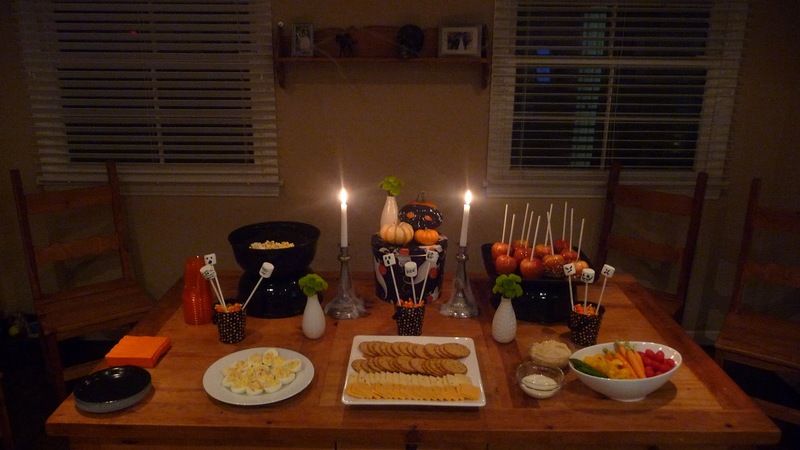 I had fun with the snack table! 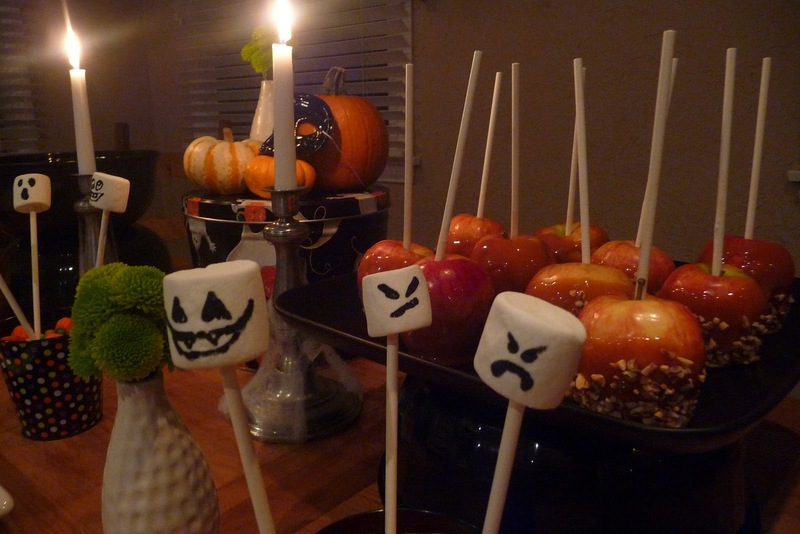 My favorite were the marshmallow ghosts that we drew on with food marker! The caramel apples were delicious! 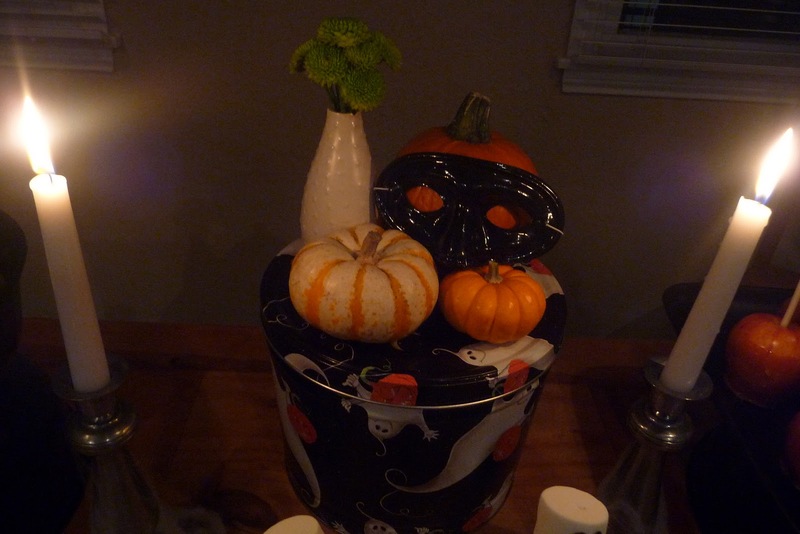 I re-purposed my mask that I wore to school on a mini pumpkin and used green button mums for some little flower arrangements. I left the house for a minute to take Michelle and Andy’s son Carter to a couple of houses on our street. 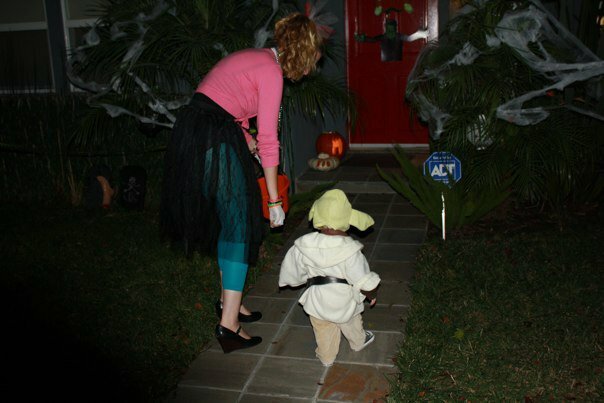 Carter was Yoda and was SO cute hobbling up to the houses with his little bucket of candy! 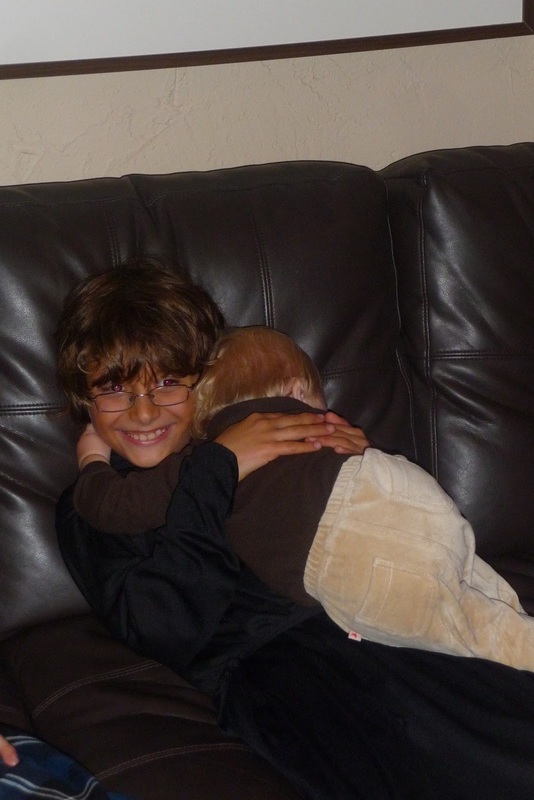 Carter loved my brother Mateo. I feel like I haven’t seen him in so long and had to get some cuddle time in for myself! 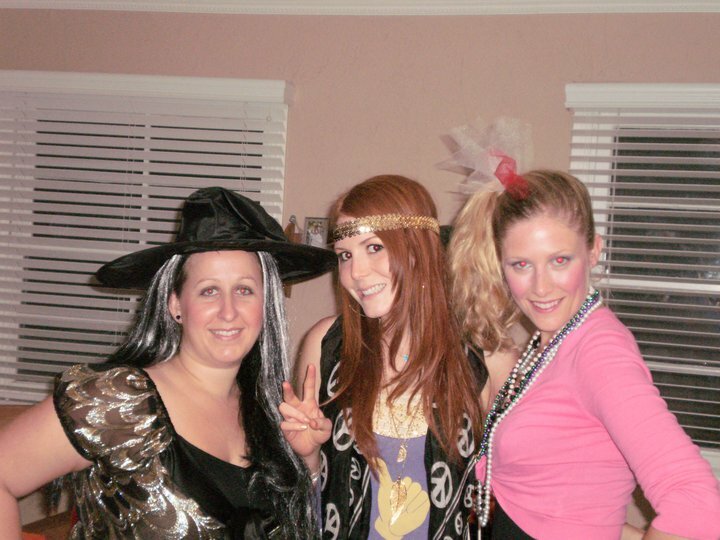 Angie and Lindsay came over as well! I missed those ladies! It was a great weekend and I’m glad we got to share it with great friends and family! so glad you could have us!!!!!! We love you guys! The fingers on the plate! LOL! Your hand looks great, like an ogre's hand.To get rid of the fat we ended up waiting for it to cool and peeling it off the foil.